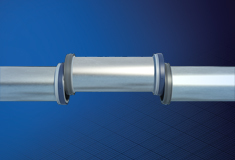 The Oil States VR Connector (VRC) is a pipeline connector that allows vertical removal of pipeline sections where little or no tolerance exists and there is a need for frequent removal or rotation to maximize wear life inside the pipe. The VRC is typically used in pipeline operations where abrasive product flow such as oil sands, slurry, backfill, etc. significantly wear the inner diameter of the pipeline. To maximize wear life, the pipeline must be unbolted, raised, rotated and bolted back together, which is heavily labor intensive. The VR Connector serves as a quick connector for large pipelines where a pin and box connection can be pulled back to clear the pipe end. It can then be lifted, rotated and reconnected in just minutes with no bolting required. Connection makeup takes less than one minute. See VR Connector animation here. Allows 360 degree rotation in place without breaking the connection. Internal sealing with primary and back up seals; no seals in the product flow path. Flush internal alignment; no gap to cause flow turbulence. Quick makeup, no on-site welding required; pipe and casing compatible.